I doubted that National could do anything more dumb than what they've been doing since the asset sales fell to bits. But they sure are trying. Mr Parker produced a graph on departures to Australia, and Mr Winter blogged on the subject. I suspect Mr Parker knew what was coming this week, because National announced the reintroduction of youth rates. I have used the graphic from Mr Winter's blog, which he attributed to Mr Parker, and added to it. 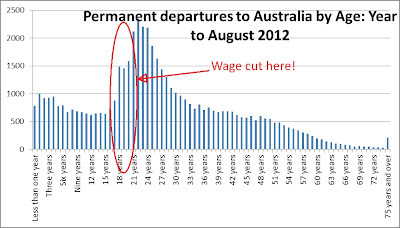 So there it is - most of the people leaving for Australia are in their twenties. National have identified that people in their late teens could be encouraged to leave at the same rate and implemented policy to suit. Regular John tried, over the weekend, to spin this as "brain exchange". And yet it's not. The net loss was 40,000 people, with almost four departures for every arrival. Are we better off, as a society, for having this emigration? Back in 2008, when it was 750 people per week (and bad), it was a problem, but now it's 1,000 people per week (worse) it's not, according to Regular John.